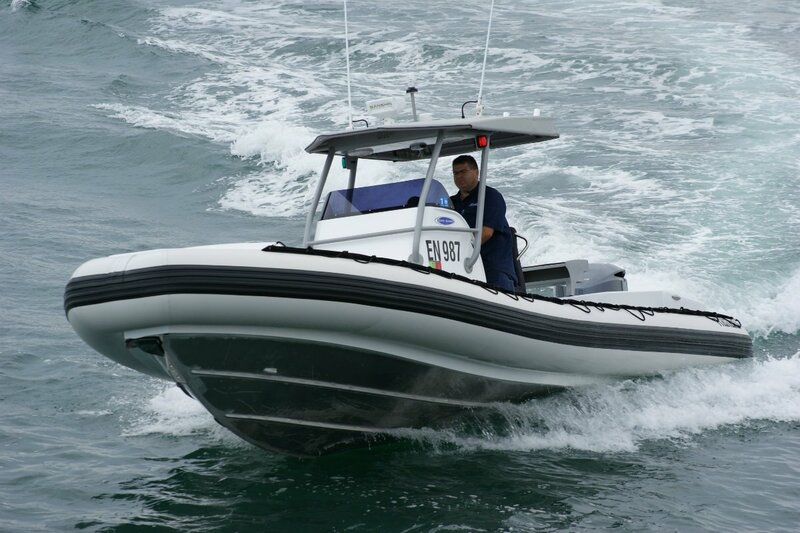 The customer for the Kirby Naiad RIB (rigid inflatable) wanted it within the Rottnest tender limits, but he also wanted a Tardis – bigger inside than out – something particularly difficult to achieve within inflated tubes. Specific requirements were pot hauling capabilities and pot storage room with space left for fishing. This had to fit in with an unusually large centre console: enough dry storage for stowing three swags was the specification. Rottnest tender is just one of the planned roles; it will also operate up north – hence the swags – as well as working out of Fremantle independent of the parent cruiser. The travel from Fremantle was the main reason Kirby fitted the trim tabs – super heavy-duty ones - that are seldom seen on Naiads. Fresh south westers would cause a lean into the wind on crossings to Rottnest that the tabs cure. 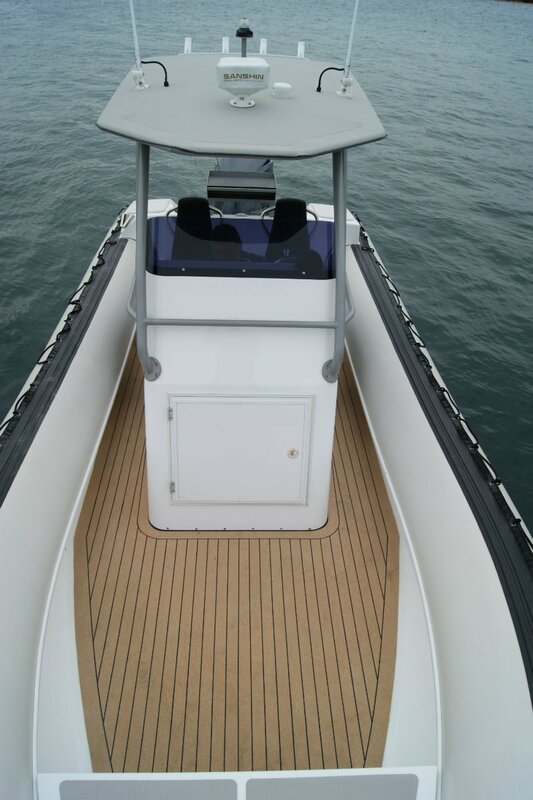 Using them for fore and aft trim as well will allow the leg to be set for the ideal angle for efficiency. At the speeds the 6.7 is capable of shades of efficiency count. 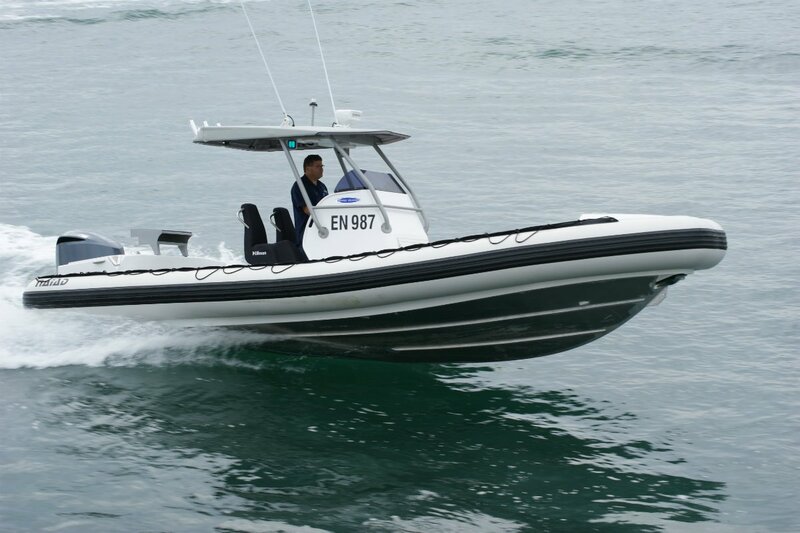 The 300hp Yamaha – the lightest and largest capacity 300 on the market – is good for 47 knots. The Naiad’s hull does a good job of absorbing the bumps at high speeds, but the Ullman suspension seats turn the ride into near magic carpet quality. The jockey-style Ullmans have been about body protection rather than plain comfort, but these Patrol model seats have a bit more width giving something like luxury. The console is set far enough aft to allow for the pot stack ahead of it and room to pass by to the forward boarding point. This is a combined seat and step up to the platform raised above the bows. There is no bowsprit up here because the anchor fits in a hawse pipe below the collar. Kirby does not usually favour this location because enormous pressure can be exerted on the anchor in hard going – enough for it to let go, with disastrous consequences. Almost as much design time went into fool-proofing this installation as for the rest of the boat. The Naiad has useful storage space besides the console, although Kirby avoids miniature lockers and the like, and has designated locations for all the awkward bits and pieces. The pot hauling arm and diving ladder, for instance, live in clips under the splash well. Ahead of the well is a folding bench seat that, when up, exposes rod holders on its underside. More holders are in the magnificent aluminium T-top. This is supported on large section pipe work that is linked at hand height by horizontal grab rails. Passengers sitting on the side tubes are able to use these as well as the rope beckets – useful items that are omitted on many current RIBs. More grab handles are built into the seat backs in exactly the spot passengers will choose to stand. The seats face a thoroughly up to date console featuring the Command Link Yamaha display and a Furuno TZ-series touch screen multi monitor. Fishing equipment is rounded off by an intricately designed bait board, although the deck sheathing possibly counts in this category. Cork styled to resemble planking, it is superior to teak in this role. Kind to feet it also grips them well, it does not suffer from the differential expansion of aluminium and timber, and it copes with fish blood and spilled oil. 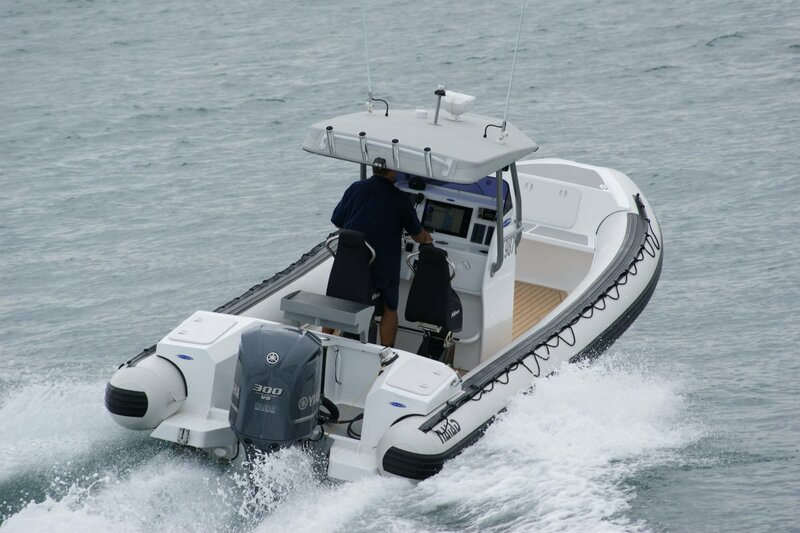 Like all Naiads the 6.7 is built in excess of commercial survey standards, giving it the strength to allow it to use its performance in almost all conditions. 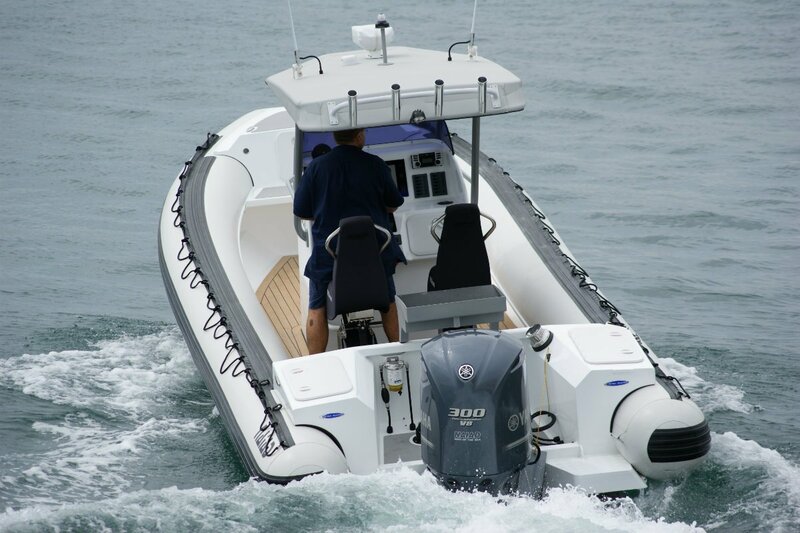 That the boat is so much stronger than its occupants is the real reason for fitting the Ullman seats. The Naiad is primarily an aluminium boat. Even with all its air chambers deflated the boat will still operate and, in belt and braces fashion, all the voids in the hull are filled with the highest available grade of closed cell foam.